Lester's 2012 and 2013 seasons weren't bad, per se. He was still an above-average starter, and 200+ innings were still a cinch for him. But, he certainly wasn't pitching like one of the game's best. Something had changed. Lester rode to success early in his career on the merits of his cutter. From 2008 to 2011, his cutter was the fourth-most valuable cutter in the league, according to Fangraphs' pitch values. 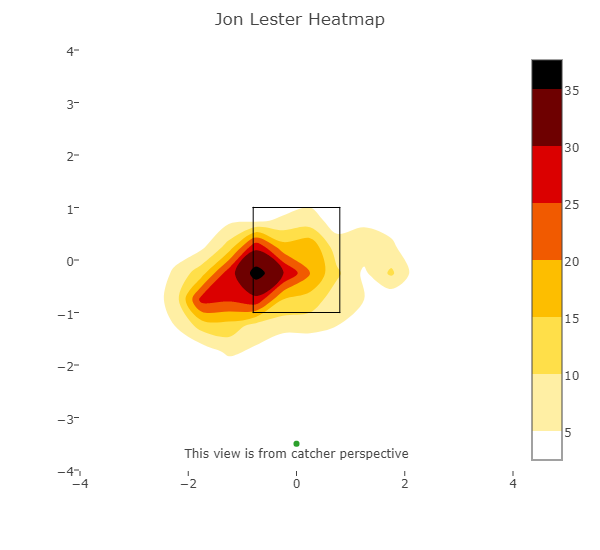 It provided Lester with 42.3 runs of value above the average cutter. In 2012, Lester's cutter abandoned him. 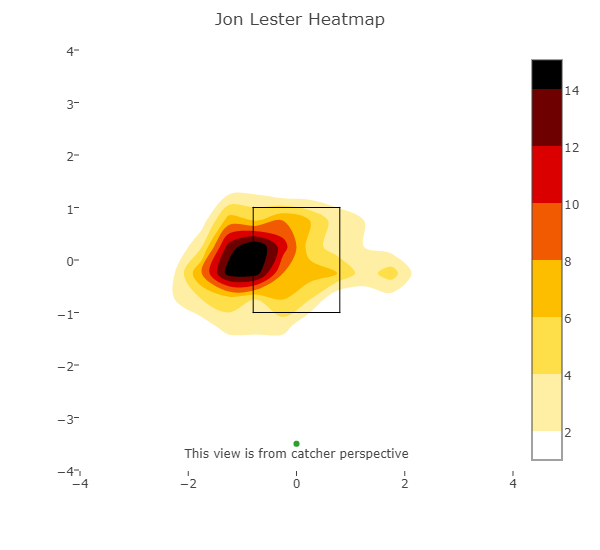 Between 2012 and 2013, Lester's cutter was worth over 10 runs below average. Once one of the league's most bewildering pitches, it was now a bad pitch that gave hitters little grief. The culprit: His cutter, well, stopped cutting. Looking at Brooks Baseball's yearly charts for horizontal movement and vertical movement, you'll notice sharp spikes between 2011 and 2012. His cutter was dropping about 2 inches fewer, as well as breaking 2 inches fewer horizontally. 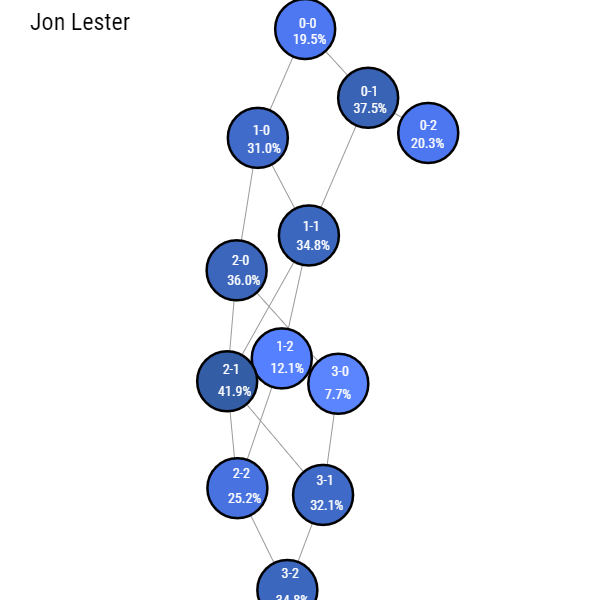 In the second-half of the 2013, Lester made a mechanical change and -- voilà! -- that otherworldly cutter returned. Lester saw his strikeout rate shoot back up in 2014, as he posted a 2.46 ERA and was worth 6 wins. With its normal cutting action restored, his cutter was worth 7 runs above the average cutter. Lester earned a $155 million contract that off-season and moved from Boston to Chicago. 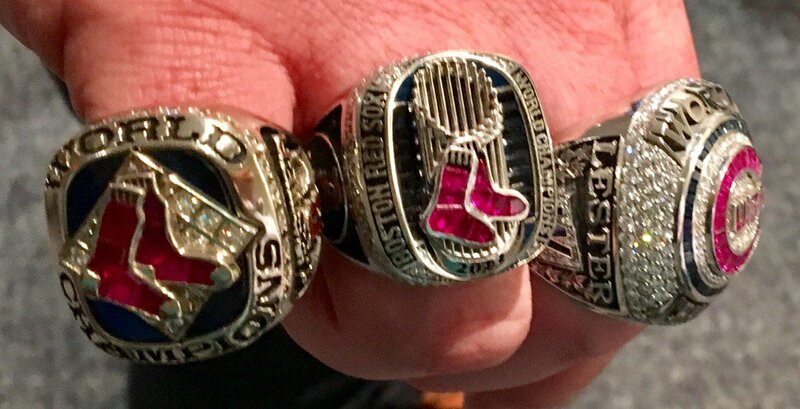 And... you know the rest -- Lester now has a third World Series ring. While leading the Cubs to the franchise's first title in 108 years, Lester's cutter in 2016 was as good as it's ever been. It was worth a staggering 18.4 runs above the average cutter, which topped the majors. It's been the league's most valuable cutter again this year. However, Lester's only recently honed in on the perfect feel for his cutter. I wrote an article on April 30 about the drops in velocity that had plagued every starter in the Cubs' rotation. My main worry with Lester was that his cutter seemed to be lacking. His fastball velocity hadn't been as much of a problem as the others'. Lester's other offerings had been way down, though. For instance, his cutter was down more than 2 mph less than where it was at last year. His cutter is a big weapon for him, and he used it to much success last year. His cutter was worth more than any other cutter in the league last year, according to Fangraphs' pitch values. His cutter has been a below-league average pitch this year. 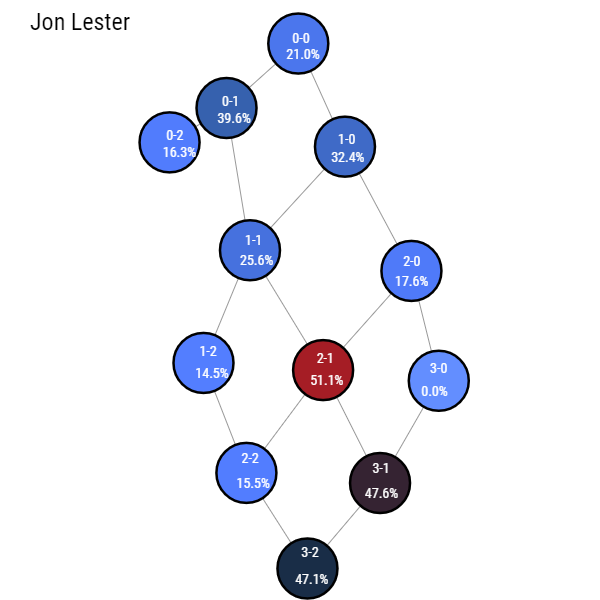 Lester's four-seam fastball wasn't down as much as the other Cubs' starters. But, his cutter velocity was way down. This concerned me a great deal. 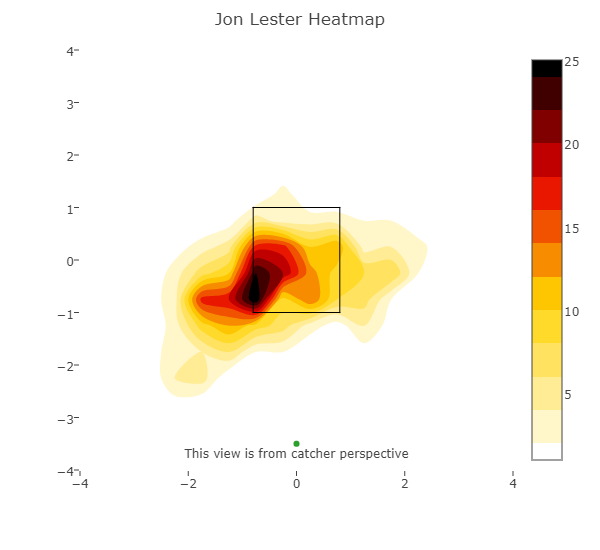 We saw earlier in this article what Jon Lester without a good cutter looks like. Lester's other offerings are still down about 1 mph from where they usually are, but his cutter velocity has been creeping up. It's still down a little, but it's close enough that I'm not as worried. Helping to ease my nerves has been the fact that Lester's cutter has been vicious lately. Here are the pitch values of his cutter over his last 8 starts: 1.5, 1.6, 1.6, 1.6, -3.2, 0.7, 1.8, 1.2. That fifth number is obviously from his disaster of a start on July 9. If we all agree to block out that one time he gave up 10 runs without completing the first inning, his cutter has been excellent basically every time he's taken the mound, for well over a month. Even accounting for that horrendous start, his cutter has been worth 6.8 runs above the average cutter over those 8 starts. Only five other pitchers have accumulated as much worth with their cutter over the course of the whole season. What's the driving force behind his cutter becoming so confounding at mid-season? Certainly the spike in velocity has helped. According to Brooks Baseball, the average velocity on Lester's cutter was below 87.3 mph 7 times in his first 11 starts. It hasn't been that low in any start since. Late in June, his average cutter velocity leaped up near, and even above, the 89 mph that it's been at in past years. It's difficult to ascribe all of his success to the velocity leap, though, since it's tailed off below 88 mph in each of his last two starts. 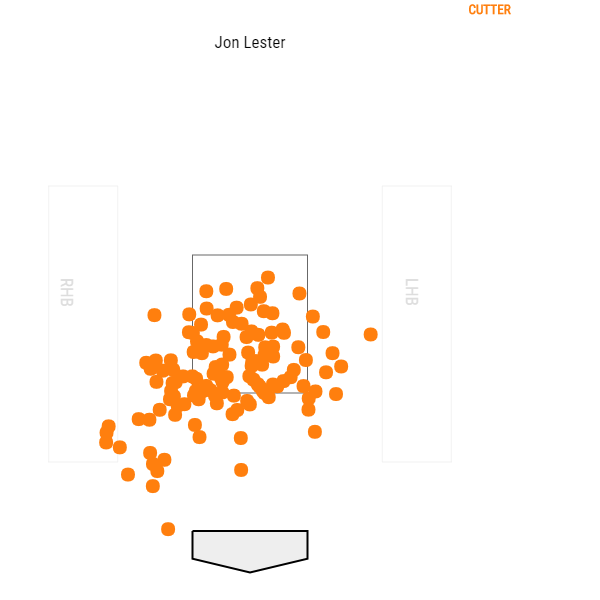 And, in Lester's last two starts, his cutter has still been quite effective, as he's given up 7 hits in 15 innings. So, no, it hasn't really been his velocity; far more important than velocity is Lester's command. As you can see in this video from Cubs Insider, when Jon has his command, he paints. Put the glove up and he'll hit it. Before we examine his command of the cutter, let's take a moment to acquaint ourselves with the pitch. Why does he use it? What exactly is he trying to do with it? Well, he can do a lot of things with his cutter. Its main function is to contrast his four-seam fastball and his sinker. While his four-seamer is rather straight (like most four-seamers) and his sinker tails off to his left, his cutter cuts the other way. Throw in his change and curve, and now he's got a bunch of pitches moving in all sorts of directions. He has hard stuff and soft stuff. And he can throw them all in different parts in and around the zone. Since 2014, Lester has ranked 1st, 1st, 1st, and 2nd in Release:Tunnel Ratio. He throws five different pitches that do completely different things. And he disguises them better than anyone. They are released from practically the same point and travel down the same tunnel towards the plate. Lester uses his cutter as a multi-purpose tool. He likes to use his four-seam fastball to start off at bats and when he's behind in the count and needs a strike. He likes using his curve as a put-away pitch when he's ahead in the count. But, he uses his cutter a lot in any count. And he'll ramp up his cutter usage when there are runners in scoring position. He mainly uses his change and curve to get whiffs. And he uses the change and sinker to get ground balls. But he can get both of those with his cutter, too. He also gets a lot of pop-ups with the cutter. And he doesn't give up many home runs with it. Batters swing at his cutter more often than at any of his other pitches. And he throws the fewest balls with it, too. 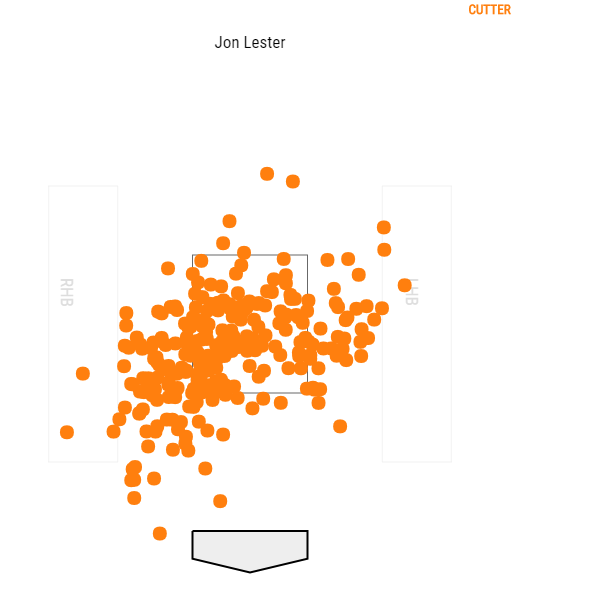 Across his career, batters have hit .242 against Lester's cutter and slugged .357. It's a dynamic pitch. It can be used to buy strikes, induce weak contact, catch hitters looking, and generate strikeouts swinging. But, until his 8 most recent starts, it had been rather ordinary this year. As of June 13, hitters were batting .270 against it and slugging .405. Since then, they are batting .193 and slugging .351 against the cutter. That includes a 3/4 performance with a double and a homer in his dreadful start against the Pirates. 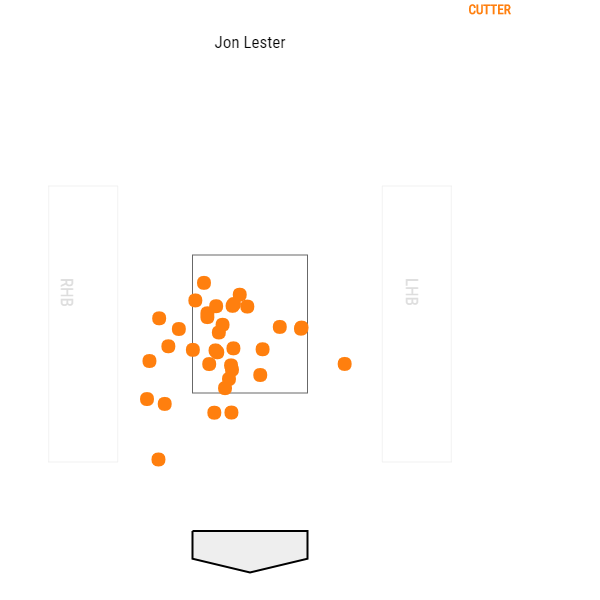 Lester can throw the cutter backdoor on a right-handed hitter for a strike looking. He can drop it below the zone and entice the batter to chase. He can use it in several different fashions. But he really likes to cut it inside on a right-handed batter's hands, and he likes to start it over the plate and have it dart outside on a left-handed batter. He'll throw it zone high and paint the edge of the zone. There are a few things that jump out here. Firstly, it's obvious he's been trying to pound the edge of the zone all year, like usual. However, the hot zone was a lot lower through June 13 than it was last year. He's bumped that back up since then. Also, notice how the red area bleeds into the heart of the zone on the second heatmap. When he wasn't hitting the edge, he was leaving it over the plate more often early on this year. Since then, the hot zone is drifting off the plate, like it was in 2016. Finally, look at how much the blob in the second image protrudes in every which direction, unlike in the other two. Perhaps we should examine some regular pitch charts to see exactly where these pitches are going. It gets a little messy because there are so many dots, which represent each pitch. But, we should be able to observe much of the same as above. Like we saw with the heatmaps above, it is obvious he is trying to pound the inner edge of the zone against righties. There is a solid wall of orange along that edge and above the bottom of the zone in 2016. In the second image (from earlier this year), he was missing way low and way inside a lot. A lot more frequently than he did last year. He also left a lot of pitches over the heart of the plate. And, you can also see when he tried to use the cutter as a backdoor pitch occasionally. Last year, he kept those pitches just off the outside of the plate, away from the hitter's power, but close enough where his catcher might be able to steal him a strike. When it appears he tried that early on this year, he left a bunch of them way off the plate. In the last image, from his most recent 8 starts, he's absolutely painting the inside edge. He's hardly missed below the zone at all. And he's left very few pitches over the heart of the plate. That is some pinpoint command. Last year, it's easy to tell his game plan: pound the outer half and the outer corner at the bottom of the zone, and just off of it. You can also see a little circular area of white over the middle of the plate. There's that pinpoint command, again. In the second image, you can tell he had trouble avoiding the heart of the plate early on this year. He also left a lot of pitches on the inner half -- albeit, mostly low in the zone. And when he missed the outside corner, he was often way off of it. 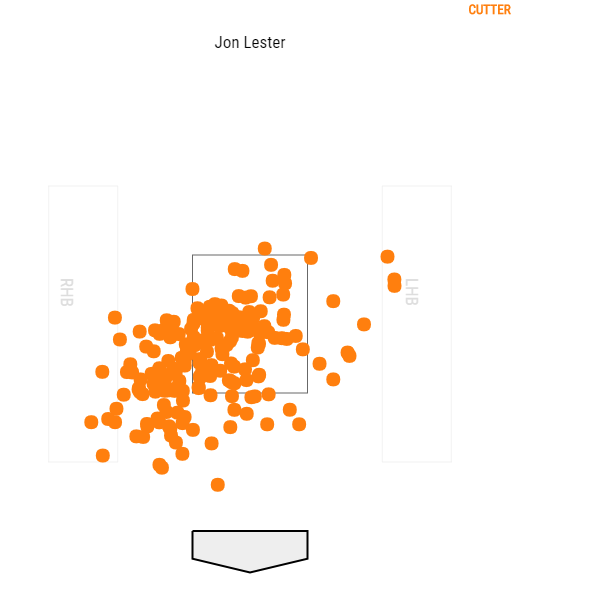 He hasn't thrown as many cutters to left-handed hitters since June 19, but he's done a good job of keeping the ball out of the middle of the zone. And he hasn't missed way below the zone like he was earlier in the year. Staying at Baseball Savant, we can see how these changes have affected his cutter's production. You can't tell much looking at his 2016 pitch breakdown alone. But, if you compare it to his pitch breakdown through June 13 of this year, you can see his cutter was going for balls more often, and not as many cutters were being put into play. That's completely changed since June 19. He's throwing cutters for balls a lot less often. And hitters are putting his cutters into play a lot. This is a good thing. 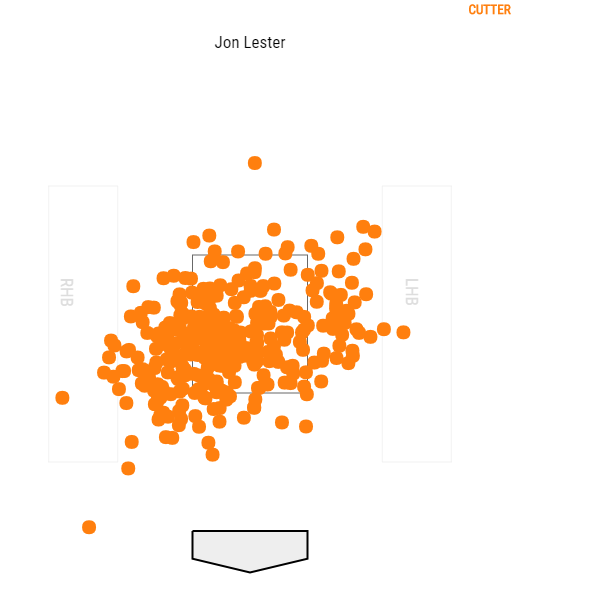 Since June 19, hitters have put 50 Lester cutters into play, at an average exit velocity of 82.3 mph. Of pitchers that have thrown at least 1,500 pitches this year, the lowest average exit velocity (off of all pitches) is 83.8 mph. 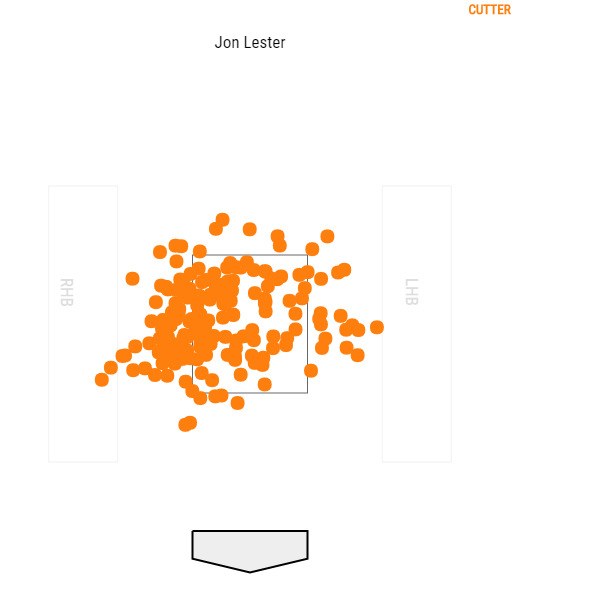 Lester is getting a ton of weak contact off of his cutter. And he's getting that weak contact regularly. Whereas, earlier in the year, his cutter was mainly being used to accrue swinging and called strikes -- at the expense of more balls, driving up counts -- now he is getting those same strikes, without the balls, while also getting an abundance of weak contact. Check out the deeper colors and the red at the bottom of the chart. When Jon's in a battle (2-1, 3-1, 3-2), he's turning to the cutter. 3-0, he'll stick with the four-seam fastball when he just needs to throw a strike. But when he's in a battle, and he's behind, he's been turning to his cutter to get him back in the fight. That's a man who knows what kind of a weapon his cutter is. Hopefully he'll keep wielding that weapon all the way through October.